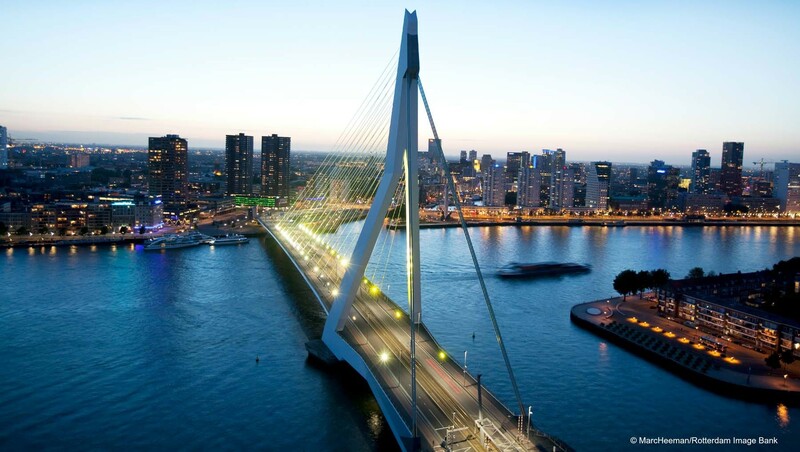 Rotterdam – the second largest city in The Netherlands – should be on top of your ‘to visit’-list and here’s why: the nightlife is amazing, the museums impressive, the architecture fascinating and the people fab. Rotterdam is one cool city and we have proof: here’s our totally random but cool guide with 10 must do’s. Enjoy! True, even the most humble city in the world loves to be called unique but I think it’s save to say that Rotterdam is truly a unique Dutch city. It’s very easy to spent a few days here and be amazed by all the thing Rotterdam has to offer. 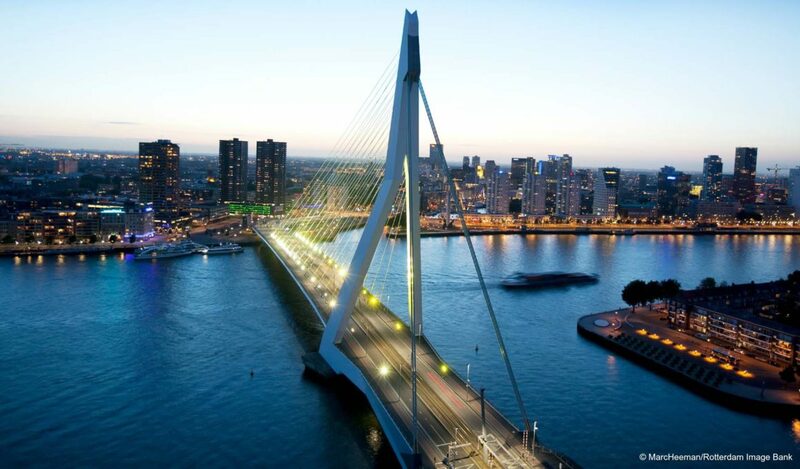 For one, Rotterdam has been nicknamed Manhattan on the Maas because of its impressive modern architecture. In Rotterdam you’ll find no cozy little centre packed with cute old houses and monuments; all the Dutch coziness was bombed flat during World War II. But: the city bounced back miraculously and it took only a couple of decades to rebuilt Rotterdam into a freaking cool postmodern city. Until today Rotterdam hasn’t stop building innovative and modern constructions; the Euromast tower, the swan-like curve of the Erasmus Bridge, the Kop van Zuid-area, the new tube-like Foodhall… Trust us, Rotterdam will surprise you with one of the most fancy and impressive skylines you’ll ever see. Nearly everyone in The Netherlands has a thing for the Dudok apple pie. It is supposed to be the best apple pie in the country and since its birthplace happens to be Rotterdam we just had to have a piece of the sweetness. The Dudok Apple Pie is served at – big surprise – Café Dudok, a modern brasserie/restaurant known for its hip and trendy crowd (and apple pie of course). Now both Jempi and I are not that crazy about apple pie but the Dudok one was the big exception; not too dry or too sweet but just perfect. Dudok keeps the recipe of the pie a secret, so don’t forget to taste it when visiting Holland, you won’t find it anywhere else. About Dudok: Dudok is a Dutch chain of brasseries/patiseries; the first opened in 1991 in Rotterdam, in a formal building of the life insurance company Nationale Nederlanden. It was designed and built right after the war, in 1945, by the renowned Dutch modernist architect Willem Marinus Dudok. Due to the characteristic design of the building and to honor Willem Dudok, it was decided to name the café after the architect. While Rotterdam is called the Manhattan at the Maas, the city is really a more like a village disguised as The Big Apple. Still, the best place to understand how Rotterdam got its nickname, is on top of the Euromast. The Euromast is concrete monument overlooking the city since 1960. It measures 180 meters at its highest point; visitors who have aren’t afraid of heights can take the lift to the outside deck (at 112 meters) to soak in the views. There’s also a restaurant (with some great views of course) and there are two superdeluxe hotel rooms to spent the night. The view on the Rotterdam skyline is simply impressive. And if you’re up to it: during the spring and summer Euromast is the place to be for some spectacular abseiling and zip wire. We dare you! Even if you’re not into art and/or musea, paying a visit to Museum Boijmans Van Beuningen is a treat. It’s impossible to take the whole collection in at once: there are over 140.000 pieces of old and modern art, artifacts, design and cool sculptures (in the park) to admire. All the big names – Fabritius, Ruisdael, Rubens, Rembrandt, Van Gogh, Frans Hals, Jan Steen, Kandinsky, Margritte, Dalí, Kokoschka, Leonardo da Vinci and many others – are present, and its collection is considered as one of the most important in the world. Pretty impressive, no? We stayed in a chique boutique hostel in the Witte de Withstraat, one of the coolest streets of Rotterdam – bars! restaurants! shops! – and the location of the Witte de With Center for Contemporary Art. This international art institution is known for its changing exhibitions and although I think modern art can be far-fetched sometimes, the art installations that were on display during our visit totally got my attention. The first one was No Humans Involved, a multidisciplinary arts collection made up of 45 artists. (side note: No Humans Involved is a LAPD slang expression from the ’70 meaning the crime/murder involved black prostitutes, drug addicts or gang members), the second was Art In The Age Of… Planetary Computation, also a project from multiple artists and all about our relation with the Internet (check out the I know where your cat lives project!). Both exhibitions have ended by now, but for new and upcoming expo’s and workshops check out their website. We’ve said it before: after years of traveling and sleeping in hostels we feel like ‘been there, done that’, it’s time for us to ‘upgrade’ and reward ourselves with a bit of luxury. Okay, but sometimes hostels aren’t just hostels. The new generation hostels are hip and chique and fun to stay at. During our latest trip to NY we switched from cool, classy & expensive to cool, classy and cheap and had the best time in both the luxury hotel and the budget hostel. Same goes for Rotterdam: we stayed at the überhip King Kong Hostel, situated right in the heart of the Witte de Withstraat. The bars and little restaurants were right at our doorstep but best of all: the hostel offers also hotel-like rooms, so had the best of both worlds; a cool hostel atmosphere plus the luxury of a private hotel room. Ow yes, burger restaurants! Upgrading a simple hamburger and presenting it as a the newest culinary trend is a big thing in hipsterland. No complaints here as we looooooove burgers in all shapes and forms. Ter Marsch & Co. used to be a small butcher shop in Witte de Withstraat owned by a Rotterdam sausage factory. Today Ter Marsch & Co is a little restaurant/bar where meat lovers can enjoy a casual meal. It is also the place where you can taste ‘The Burgeresse’, a hamburger that has been awarded for ‘the best burger in the Netherlands 2015’ and yay for us: we got to taste this lovely prize winner. So what’s The Burgeresse all about? Just imagine: 150 grams of Scottish Angus beef and Japanese Wagyu, with winter truffle gravy, young lettuce, pickles, plum tomato, red onion, farmhouse cheese and a home-made Ter Marsch sauce. While the new Food Market Hall get’s most of the tourists attention, there’s another little hotspot for foodies that deserves some love. Right at the outskirts of the town center The Fenix Food Factory gave the former dockside area a second life by turning the outdated warehouses into an unpolished version of a food court. There are little restaurants and bars (all very down to earth) and local producers who present their artisan meats and breads, home-brewed beer, organic products, cheese etc. It’s all very basic, a bit raw but absolutely charming and very urban. There’s room to sit inside – on some old couches and picnic benches – but it’s really the outside terraces (partly made of pallets) you’ll want to be: the view over the city skyline and the harbor is the best. The elegant steamship SS Rotterdam was one of the great Holland America Cruise ships in the late fifties and became quickly famous as the ship that could bring you across the Atlantic to the ‘new world’, America (destination New York!). The steamship retired in 1977, so no more exiting trips for the SS Rotterdam. The former cruise ship now lies permanent at the quay in Katendrecht and is still open to the public: it serves as excellent hotel, restaurant, wedding-, event- and party location, museum and it’s Lido terrace (with bar and swimming pool) is a popular place to spent a couple of hours enjoying the great ambiance a spectacular view. There are (audio)guided tours and we would definitely recommend them: it’s like taking a trip into the past, so romantic and really nostalgic. Visiting the SS Rotterdam was actually one of the highlights of our trip, an unexpected and fab blast into the past. Tip: the hotel rooms are authentic 50’s style (like the rest of the ship), and you can visit the old engine room (with the formal engine employees as guides). The Rotterdam party scene is amazing. The city is known for its active and vibrant nightlife and there’s no shortage of big clubs, night entertainment and concerts. We checked out the nightlife in – again – the Witte de Withstraat. The street is a popular place for a fun night out and its trendy bars and restaurants attracts huge crowds. We were certainly amazed by the great yet relaxed atmosphere. Tip: visit the bar De Witte Aap, it was named as the best bar in the world by Lonely Planet. I’ve never been to Netherlands and I am surprised to see how modern Rotterdam is. I was expecting it to be more like the old European cities. This is a very cool guide indeed and for someone like me who has never been there, it comes in very handy. I’ll make sure to bookmark this page. You have so beautiful photos here! I urgently need to visit Rotterdam. It’s so close and I’ve never been! I spent a bit of time in the Netherlands last year and unfortunately missed Rotterdam. The more I see about it, the sadder I am about that. I guess I just need to go back. It seems like a really cool and unique city. Rotterdam was a surprise for me too! If you should go back to the Netherlands, you really should give Rotterdam a try, I’m sure you’ll like it. You know, I haven’t really heard much about Rotterdam and I guess I know why – because when people write about Europe, they write about the old places, not cities that have been destroyed and built anew, but I really like the skyline of Rotterdam. And the SS Rotterdam looks absolutely worth visiting too! Thanks for the list! I might have to save it for my visit there. Hi Jolanta, yes, you shouldn’t miss out on the SS Rotterdam; it’s a unique experience to visit a cruiseship from the fifties. Thanks for stopping by! Beautiful captures. I would love to visit. You made it look so amazing.